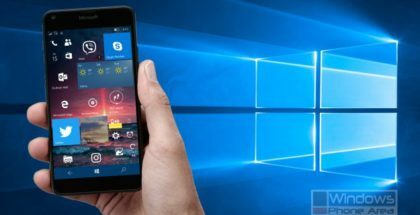 If you are worried about possible privacy problems in Windows 10 Mobile, here are some quick tips to better protect your personal life and data. Stop Notification pop-ups from appearing. 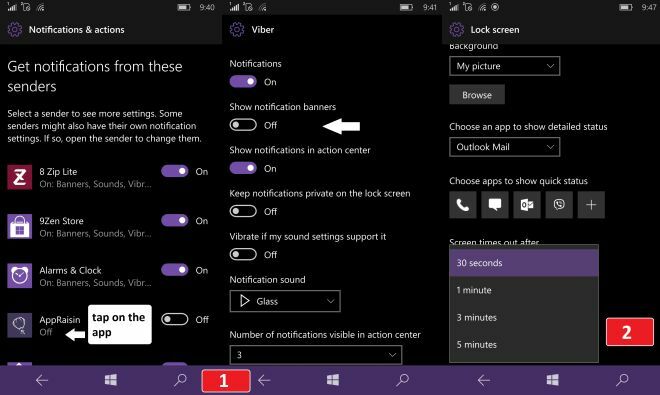 Windows 10 Mobile allows you to change the way you get notifications from any app you want. By default, notifications banners from some apps (like instant messengers) may constantly pop up on the screen, which may cross the privacy line. To stop a notification banner for an app, go to Settings → System – Notifications & Actions. Scroll down to the bottom of the page, click on the app you want, and disable the second switch – Show notification banner. You can also change the notification sound from the same page. Set screen time out to 30 seconds. To prevent unwanted access to your phone, set the screen time out to the minimum – 30 seconds. That would automatically lock the phone 30 seconds after you last used it, which would protect the device better in many situations, like you working in a large office with many curious colleagues around. If you have a phone that supports Glance Screen, you probably always use it because it’s a great feature. 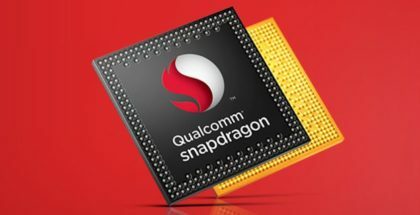 But that would easily allow other people to see information from your phone by simply waving a hand around the proximity sensor. To better protect your privacy, do not select an app that shows sensitive information on the lock/glance screen. Go to Settings → Personalization → Lock Screen. Change the settings from the ‘Choose an app to show detailed status’ menu. All Windows apps and services can use your location, but you can change that from the Privacy settings. In the Location page, scroll down to the list with apps that can use your precise location. Disable the switch for any app you don’t want to use your location. Keep in mind that some of the apps may not work properly after you disable the location access for them. Windows apps may often require access to the microphone, but in theory some of them could abuse this access to record audio or even spy you. 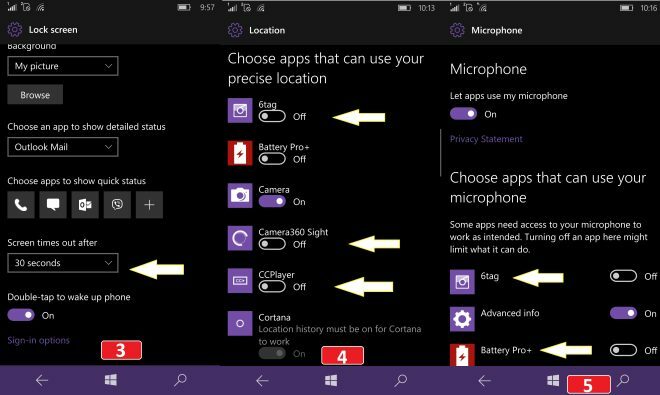 To stop apps from accessing your microphone, go to Settings → Privacy → Microphone. Turn off the option for any app you want. 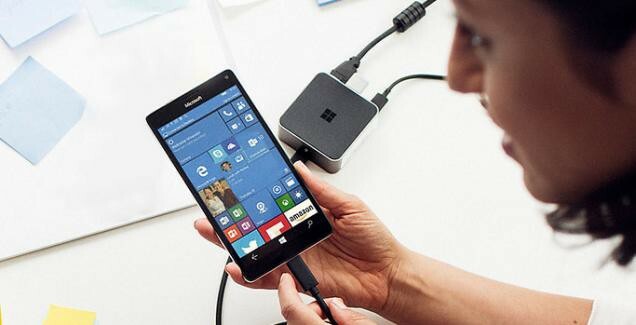 Windows 10 Mobile and phones with motion sensors automatically use your motion data and collect motion history. Apps like Fitbit can access your motion data to count steps /distance, but you can easily change the settings from the menu. In Privacy → Motion data, you have two options: first you can completely disable the motion data. Second, you can choose which app can use the motion data from your device. Windows collects information like typing patterns, speech and handwriting data to improve the user experience and provide better suggestions. 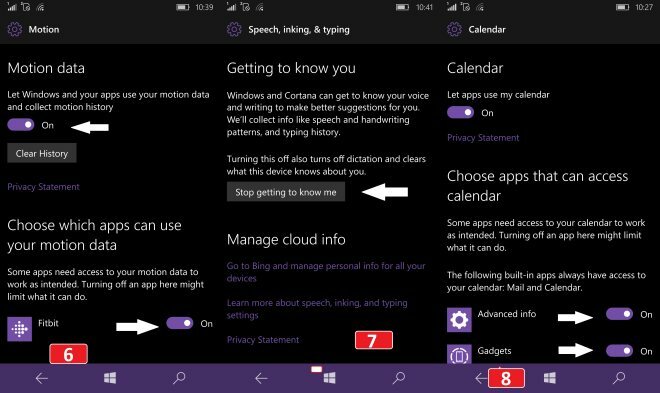 Stopping ‘getting to know you’ feature would improve the privacy on Windows 10 Mobile. If you are afraid that some apps may abuse the access to account info, contacts and calendar, you can stop this access from the Settings → Privacy. Tap on the sub-menu, and disable the switch for these apps. By turning the Advertising ID feature off, you would make it harder for apps to track your behavior and serve relevant ads. However, this would also improve your privacy. 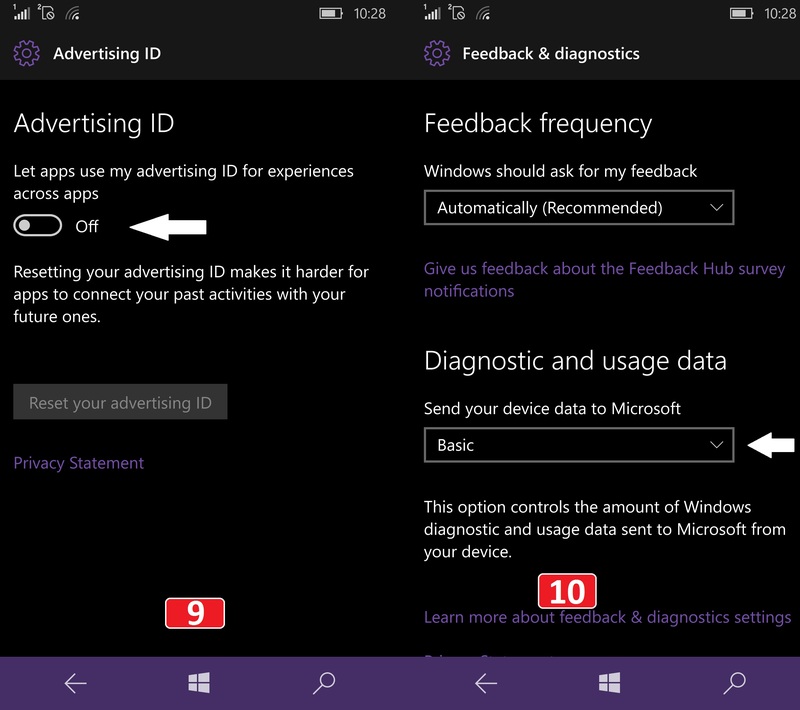 Windows 10 Mobile allows you to select how you send diagnostic and performance data to Microsoft. 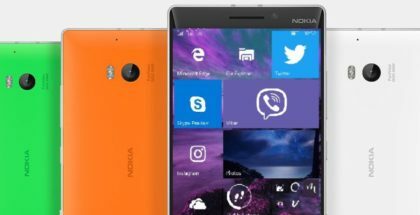 Although Microsoft recommends to select ‘Full, we would switch to ‘Basic’, which would not only improve your privacy, but also reduce the data traffic and improve your battery life. Selecting ‘Basic’ means that your device will only send information to Microsoft that is vital to the operating of Windows 10.